Like all large airports, Aéroports de Montréal (ADM), which operates Trudeau and Mirabel, is a major contributor to the local economy. Yet ADM feels it’s not adequately served by public transit compared to other major cities. This may change in the future, but not immediately. With the Caisse de dépôt et placement du Québec pension fund as a partner, the Quebec government has identified two priorities. One is a rail link between the South Shore to downtown Montreal over the new Champlain Bridge expected to be completed in 2018. The other would be a new rail link between downtown and the West Island (one already exists on CN and CP lines) with a spur to Trudeau Airport. In a brief submitted to the Committee on Public Finance’s consultations on Bill 38 to allow the Caisse to carry out infrastructure projects, ADM laid out its case to integrate the two projects on a dedicated track using a Light Rail Transit (LRT) system. Passenger traffic at Trudeau has grown significantly, from 10 million in 2000 to 15 million last year. It is projected to reach 20 million by 2025 and 25 million in 2033. “According to current, rather conservative figures, the West Island LRT would generate ridership of 60,000 passengers a day, including 10,000 for the airport shuttle service (which would represent between 20-25 per cent of all daily arrivals and compares to 4,000 passengers handled by the 747 bus service). By adding the approximate ridership of the South Shore LRT, we could easily reach a total of 130,000 travellers, without even factoring in the synergy effect of using the same rolling stock for the entire system. There’s major potential,” Cherry said. He also pointed out there is a higher concentration of passengers arriving at Trudeau who travel downtown, approximately one in three, compared to one in seven at Toronto’s Pearson. The ADM brief noted it has been studying a shuttle service to downtown since 2002 and has spent more than $40 million on related infrastructure work. The work is important to remain attractive against competitors such as Plattsburgh, N.Y. and Burlington, Vt.
Cherry would like to see a service similar to Vancouver’s Canada Line started in 2009 where one in two LRT trains goes to the airport and the other to Surrey. In Montreal’s case, one in two would go to the airport and the other to the West Island, exclusive of service to the South Shore. “By integrating these two projects converging toward downtown, we would create a new urban transit network that would be very much larger than the sum of its two parts,” Cherry said. 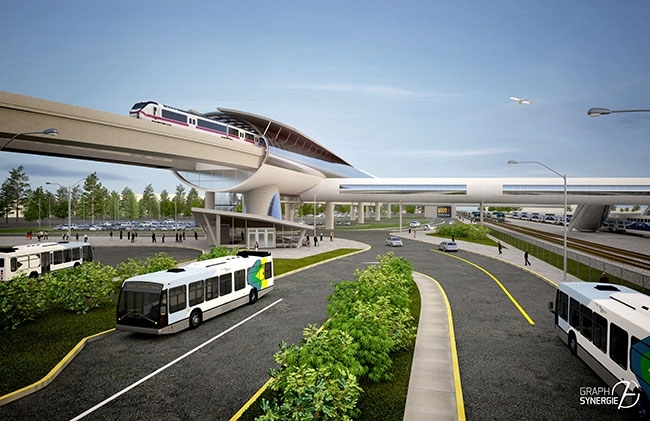 “Such a network, with a branch to Montréal–Trudeau airport and connection to the metro, would directly link the South Shore to the West Island, passing through downtown Montreal. It could include stops at Nuns’ Island, the Citédu Multimédia, at Lionel-Groulx and Atwater Market, in Lachine, in Dorval, and so on. The integration and harmonization of the two projects could also result in substantial economies of scale, both in the development phase and during operation. Among others, according to ADM experts, converting the downtown terminal into an intermediate station would reduce the West Island LRT infrastructure costs. Airport accessibility would also be greatly improved, especially for people from the South Shore who would be able to get there without transferring. Over the longer term, such a network would offer opportunities for linking other sectors not yet served by a public transit system. As the lead on such a project, the Caisse would decide to either go it alone or make it a public/private initiative. If the private sector were involved, engineering firm SNC-Lavalin would likely be interested since it’s part of a consortium building the Champlain Bridge. And Bombardier is probably salivating over the possibility of building all those rail cars.